How about an easy Thai dessert? Today, I’d like to present to you the recipe for sweetened millet with coconut milk. This dessert is called ‘luk dueai peak’ (ลูกเดือย) in Thai. You can also find this treat in Thai local markets where it is often sold. This dessert can be served hot or cold. The following video will show you how to prepare millet with coconut milk. 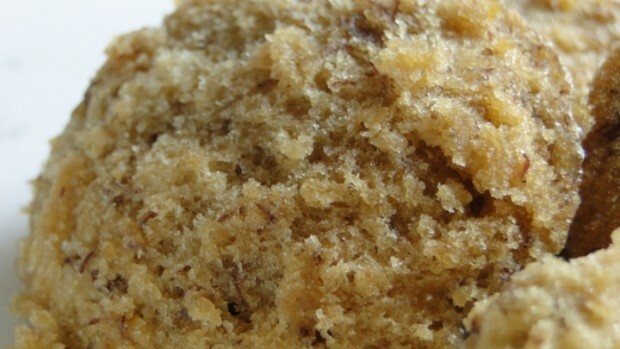 You can easily learn how to cook this sweet treat. 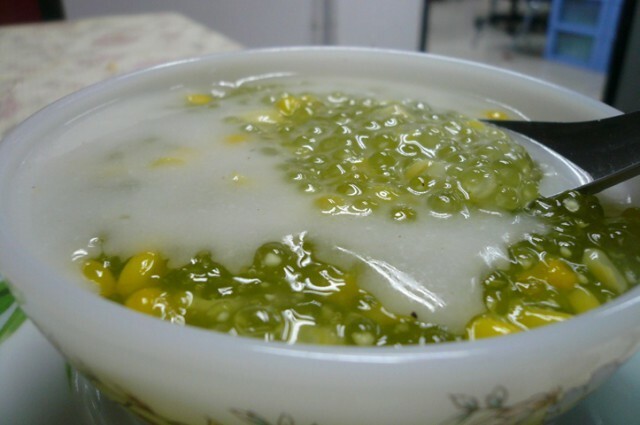 Hope you’ll give this Thai dessert a try! Thai egg cake is called ‘Kanom Kai’ (ขนมไข่) in Thai. This is a traditional Thai dessert recipe influenced by the Portuguese. The perfect egg cake should have a light texture, be soft inside and crispy outside similar to sponge cake and should not be too sweet. This recipe for Thai egg cake comes from the amazing cooking channel WhatRecipe.tv. In the following video, you can easily learn how to make this dessert. Hope you’ll give this amazing Thai dessert a try! Today I come to you with an easy and delicious Thai dessert. It’s sweet sago with young coconut meat which is called Sa Koo Ma Prao On (สาคูเปียกมะพร้าวอ่อน) in Thai. If you love traditional Thai desserts and the fresh taste of coconut, this is the treat for you. Sweet sago (i.e. tapioka pearls) are combined with young and soft coconut meat and topped with coconut cream 🙂 Let’s prepare this treat! First take a pot, bring water to a boil adding the coconut water. Then rinse the tapioca pearls and put them into the pot. Let them boil until cooked. Add the sugar and the young shredded coconut (& sweet corn, optionally). Stir and mix everything together well, then set the pot aside. Now prepare the coconut cream topping: take a small pot and put in the coconut milk/cream, salt and rice flour. Stir until all ingredients are mixed together well and the mixture thickens. It’s time to serve! Fill the sago into a bowl and top this with the coconut cream mixture. 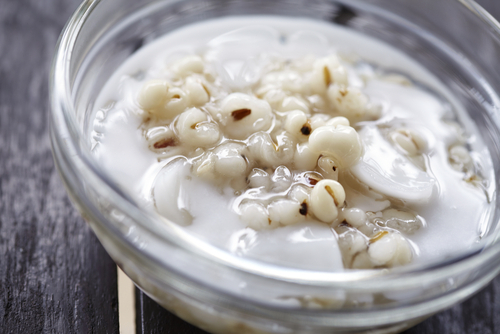 The following clip shows you how to prepare this Thai dessert, sago with coconut cream, easily. I hope you give this delicious treat a try! First wash and cut the pumpkin into slices. Then soak the pumpkin in the lime water for about 30 minutes. In the meantime you may boil the sugar in water. Add in the lime juice and stir until the sugar is dissolved. Then put in the pumpkin slices and let them simmer until the pumpkin is cooked. Remove the pumpkin from the mixture and set the slices aside on a plate or tray. Now it’s time to prepare the coconut topping. Take a pot and put in the coconut cream adding the rice flour and salt. Boil the mixture on a low heat until it thickens. It’s time to serve! Arrange the pumpkin on a plate and garnish with the coconut topping. This recipe for pumpkin in syrup comes from the amazing cooking channel WhatRecipe.tv. In the following video, you can easily learn how to make this dessert. 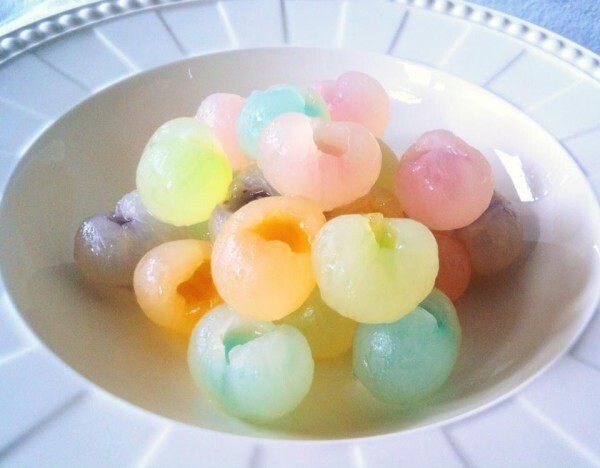 Today I come to you with a fun and easy Thai dessert called Khanom Sum Pun Nee (ขนมสัมปันนี). These are Thai coconut cookies which are made from tapioca flour mixed with coconut cream. The special feature of these cookies is that they are not baked 🙂 This dessert is often served on the occasion of traditional Thai weddings. First, roast the tapioca flour for 2-3 minutes on a low heat. Then set the roasted flour aside. Second, heat the coconut cream and sugar on a low heat until the mixture thickens and add some drops of jasmine flour. In the next step, pour this mixture onto the roasted tapioca flour and mix everything together well. Now take parts of the mixture and add some food colouring. Then knead the mixture until smooth. Finally press the mixture into your cookie moulds and take them off. Arrange your cookies nicely and you’re ready to serve! The following video shows you how to prepare this amazing Thai dessert easily. Just follow the steps! I hope you’ll give Thai coconut cookies a try! 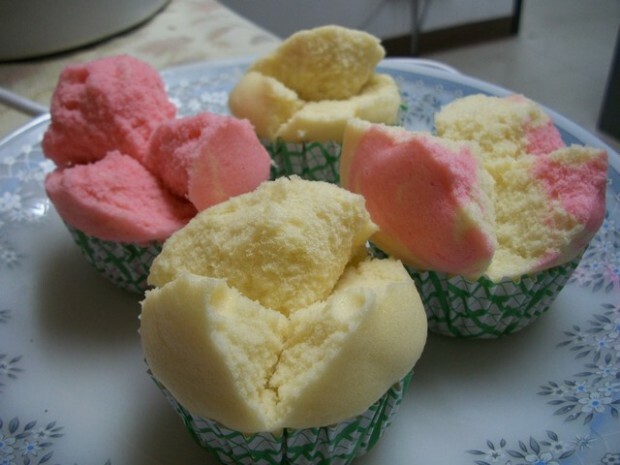 Thai steamed cupcakes are called Khanom Pui Fai (ขนมปุยฝ้าย) in Thai. This is a light and fluffy traditional Thai dessert and it is called ‘Pui Fai’ because when steamed the cake expands like cotton wool. 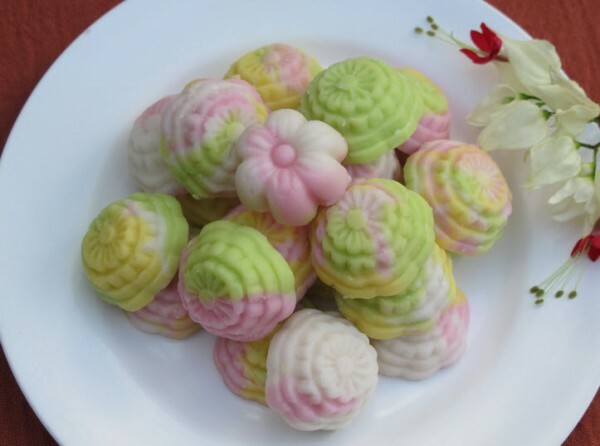 This dessert is often served on auspicious occasions but it is also a common Thai street food. 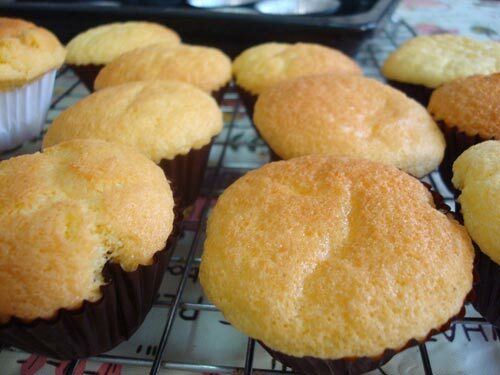 The cupcakes are easy to prepare since not so many ingredients are needed. First, take a bowl, sieve the flour and add the baking powder. Take another bowl, put in the water and the emulsifier. Whisk everything together well and add the sugar and the egg. Put in the condensed milk and mix everything together well. Add the lime juice and the flour. Gently fold the ingredients in and add some drops of jasmine flavour and finally the food colouring. Take your steamer basket and prepare the cake cups. Then pour the mixture in the cups. Now let the cakes steam for about 15 minutes. Let the cakes cool down and you’re ready to serve! 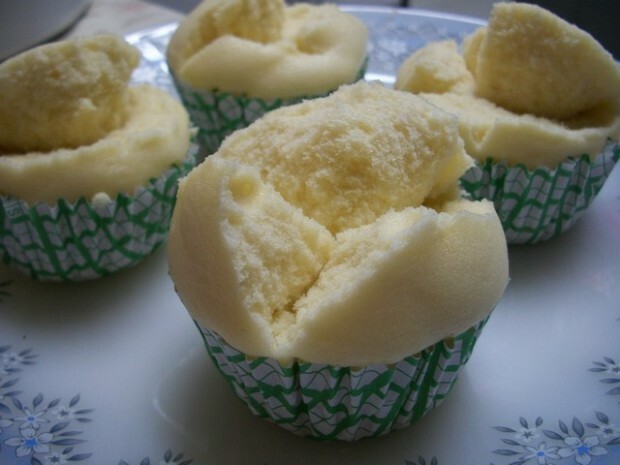 This recipe for Thai steamed cupcakes comes from the amazing cooking channel WhatRecipe.tv. In the following video, you can easily learn how to make this dessert. In a first step, sieve the flour into a large bowl. Add the baking powder and soda and set the mixture aside. Take another bowl and put in the bananas which should then be mashed either by hand, with a fork or with a blender. Add the palm sugar and mix everything together well. Take an electric mixer and add the sugar and salt. Continue mixing until everything is well dissolved. Put in the egg and mix. Then add the milk and about half of the flour and butter. Mix well together and finally add in the remaining flour and butter. 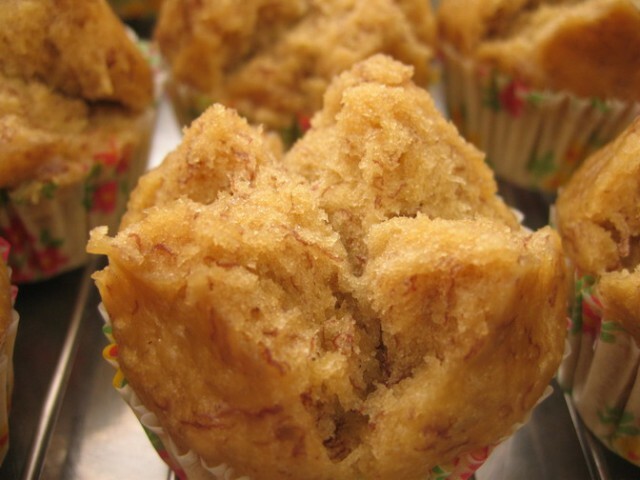 This recipe for steamed banana cupcakes comes from the amazing cooking channel WhatRecipe.tv. In the following video, you can easily learn how to make this dessert. 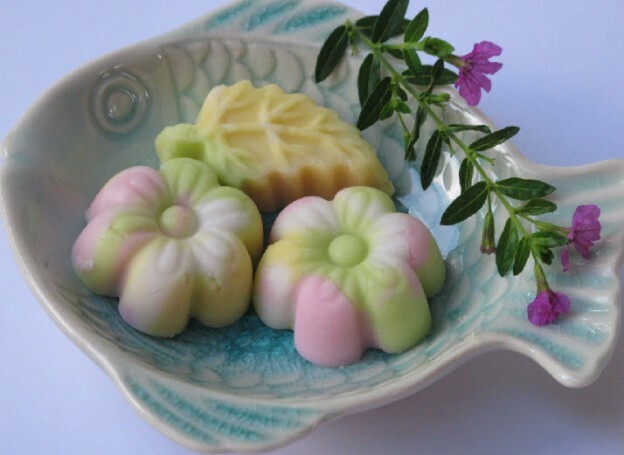 Hope you’ll give this amazing traditional Thai dessert a try! Wash the pumpkin and cut it into bite-size pieces. Then soak the pumpkin pieces in lime water for about 30 minutes. Take a pot and bring the coconut milk to a boil. Add in the pumpkin and boil until it is cooked. Then put in the palm sugar, sugar and salt. Stir until the sugar and salt are well dissolved. You’re ready to serve! This recipe comes from the amazing cooking channel WhatRecipe.tv. In the following video, you can easily learn how to prepare this easy Thai dessert. This recipe for Jewels Jelly comes from the amazing cooking channel WhatRecipe.tv. In the following video, you can easily learn how to make this dessert. 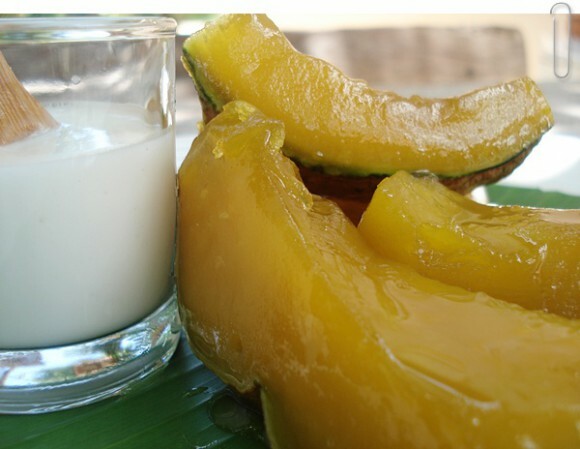 Hope you’ll give this beautiful and refreshing Thai dessert a try! Today’s media review is about Das (Baan) Thai Kochbuch by Chainarong F. Toperngpong (text & layout) and Gisela Goppel (illustrations) (ISBN: 978-3941087477). The second edition of this book was published in 2014 by Jacoby & Stuart, Berlin. 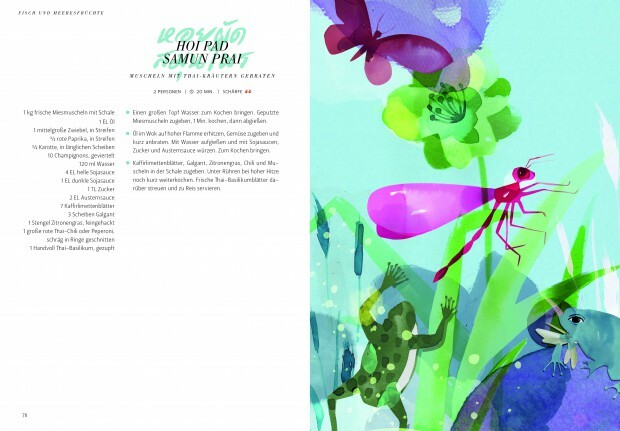 This book is in German language, comprises 140 with colour illustrations throughout, flexible hardcover. It costs 19,95 EUR. 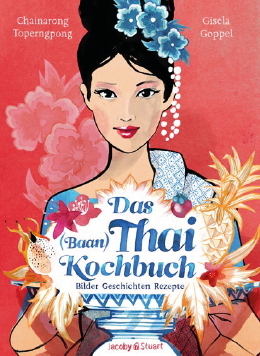 In ‘Das (Baan) Thai Kochbuch / The Thai Cookbook’ the author Chainarong Toperngpong presents the reader his most popular Thai family recipes and the classic recipes of his father’s Baanthai restaurant (1982-2011) in Germany. What is more, he makes the reader familiar with Thai table manners and also shares personal, amusing and hilarious anecdotes from the Baanthai restaurant. 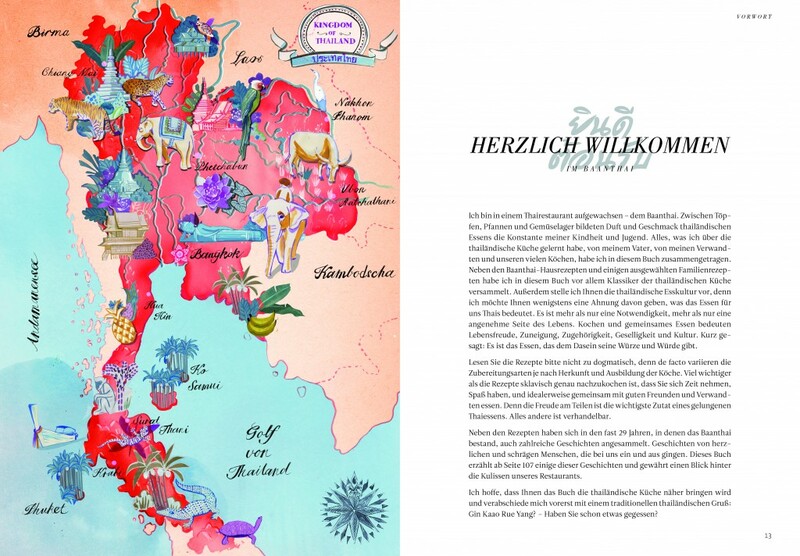 The book is beautifully illustrated with colourful and exotic paintings by Gisela Goppel. Thus, the cookbook starts with an introduction (Herzlich Willkommen) and some basic information about the structure of the book and the recipes concerning portions, options for vegetarians and the glossary. The cookbook has nine main chapters which are about ‘Basic Recipes’ (Grundrezepte), ‘Soups’ (Suppen), ‘Appetizer’ (Vorspeisen), ‘Stir-Fries’ (Wokgerichte), ‘Fish & Seafood’ (Fisch & Meeresfrüchte), ‘Currys’, ‘Recipes/Menus for Families’ (Familienessen), ‘Desserts’ (Nachspeisen) and stories about the ‘Baanthai’. 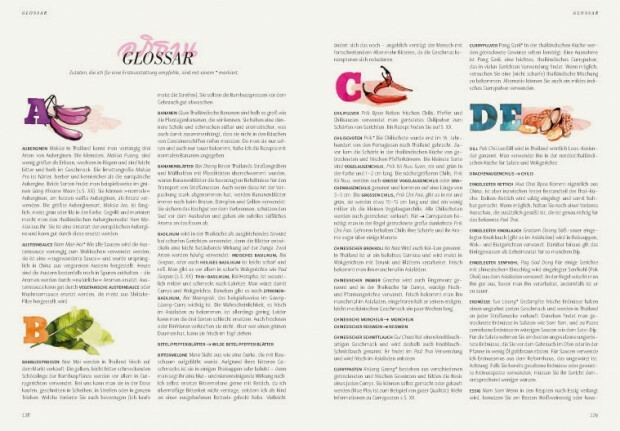 The book closes with a glossary, menu suggestions and an alphabetical register. The first chapter about ‘Grundrezepte’ (Basic Recipes) seems to be the largest chapter of this book. It presents the most important Thai basic recipes like those for making curry pastes, dips, roasted chili powder and information about how to prepare Thai sticky rice and steamed Jasmin rice for instance. The following chapter about ‘Suppen’ (Soups) presents popular Thai soups like Tom Yam Gung (Sauer-scharfe Suppe mit Garnelen) and Tom Kha Gai (Kokossuppe mit Hühnerbrust und Galgant). These are all time favourite soups among Thai people as well as Westerners. The next chapter about ‘Vorspeisen’ (Appetizer) presents recipes for preparing well-known and loved Thai snacks and appetizers like Tord Man Pla (Thailändische Fischtaler), spring rolls, glassnoodle salad and green papaya salad (Som Tam), for example.The following three chapters about ‘Wokgerichte’ (Stir-Fries), ‘Fisch und Meeresfrüchte’ (Fish & Seafood) and ‘Currys’ sum up the essence of Thai cuisine and also point out the importance of seafood and different kinds of curries in Thailand. The chapter ‘Familienessen’ introduces recipes for ‘families’ and is the most interesting section in my view. 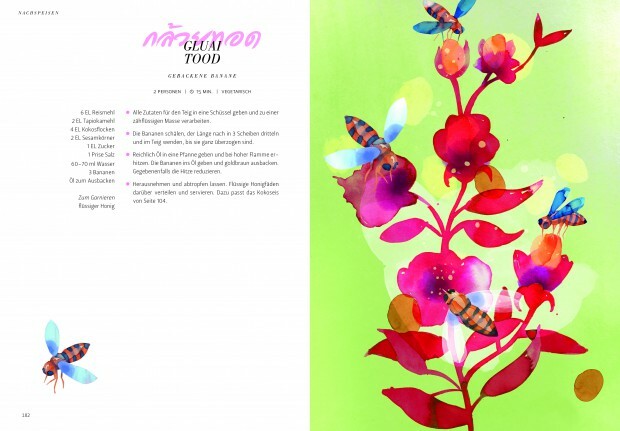 These are the author’s most beloved Thai family recipes and are those Thai dishes that the Baanthai restaurant staff liked to eat. These were recipes that were not included in the restaurant’s menu. Hence, some of these recipes might appear unfamiliar and exotic. An example is ‘Muu Palo’ (Schweinshaxe Thai-Art) which is Thai style pork leg. The author points out that many of these dishes are of Chinese origin. 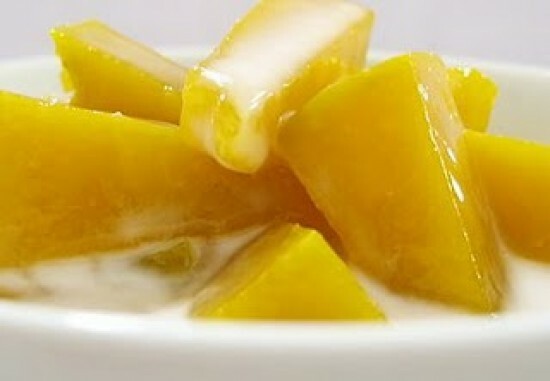 For all sweet tooths ‘Nachspeisen’ (Desserts) offers a small but mighty selection of the most popular Thai desserts like sticky rice with mango (khao niaow mamuang) and fried bananas (gluai tood). Finally, the last chapter offers personal and amusing stories about the Baanthai restaurant.